We’ve recently added two much-requested features geared around editing lots of frames at once, namely deleting and creating frames in batches. To take advantage of the bulk delete function, select the frames you want to remove by holding command and clicking on the image for a given frame. Selected frames will appear lighter in colour and have a grey border around them. Then when you’re ready, click “Delete selected” and you’re done! You can also now create multiple frames by dragging images into your storyboard, even when the storyboard has existing frames. 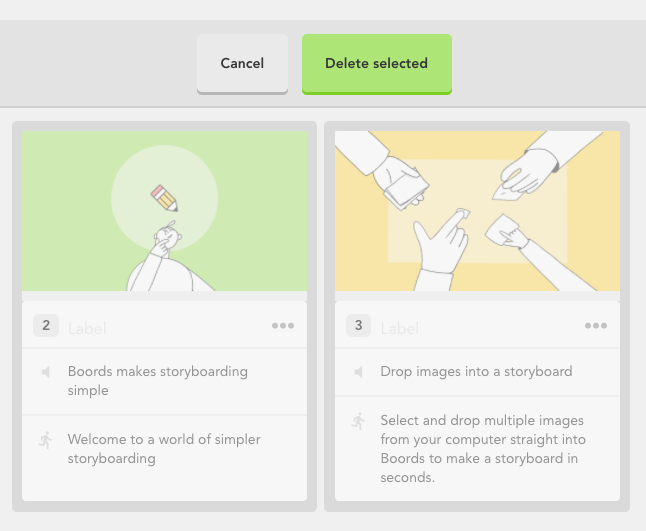 Simply drop images into the storyboard edit screen from your computer and they’ll automatically be created as frames.